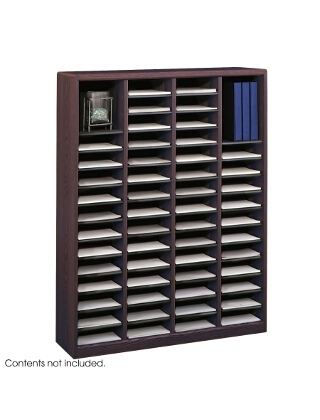 Effortless organizing at your fingertips will be a great addition to any mail room, office, school or store. Use compartments as a mailbox, material holder, or stationary sorter. The sturdy 3/4" furniture-grade compressed wood construction assures maximum strength and stability. Hardboard shelves form 60 letter-size compartments which hold up to 750 sheets. Individual compartment shelves remove to expand compartment size. Black plastic label holders complement finish. Quick and easy assembly with precision engineered cam-lock system.